The Fisher's Ghost Youth Orchestra is a not-for-profit organisation that was formed in 1987 with the aim of providing the South-West Sydney community with it's own orchestra. FGYO is comprised of a Training Orchestra and a Senior Ensemble. These separate orchestras encompass Primary School Students through to University Students. Our membership also includes some passionate adult musicians who are mentors for the younger members. •	Performances at local shopping centres and schools. 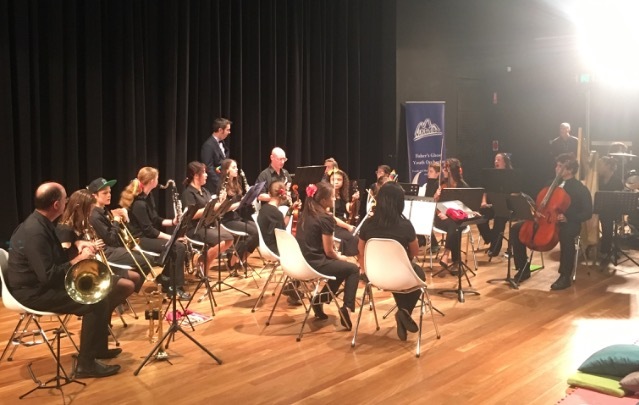 The Orchestra aims to promote the musical development of young people in the Greater South-West Sydney Region by providing opportunity to motivate and inspire students through participation in regular performances and regular school holiday workshops that are open to the public. The Senior Ensemble also provides school leavers the opportunity to keep up and improve their musical skills beyond High School. The Orchestra performs a diverse repertoire - you'll find an ever-growing mix of the traditional to the progressive: classical, baroque, romantic, modern, post-modern, ballet music, film music, music from musicals, music from operas, Irish and other folk music, and even music from computer games. The orchestra has been active in performing premiere performances of new works, including some by it's own members. The orchestra operated a Training Orchestra from 2001, to cater for younger and/or developing musicians. FGYO now focuses on musicians at the Training Orchestra level. Training Orchestra members eventually 'graduate' to the Senior Ensemble, while still remaining active mentors and buddies for our younger musicians..
To keep up to date with FGYO's regular performances and outreach programs, LIKE the Fisher's Ghost Youth Orchestra on Facebook, or add FGYO to your Insta or Twitter feed. There are many costs associated with running a community orchestra. Increasing hall hire and insurance costs cause a financial strain and are necessarily reflected in member's fees. If you are able to offer sponsorship to contribute towards these expenses the Orchestra would be most appreciative. FGYO would be very happy to include advertising and or acknowledgement on our website, concert advertising and programs to any business or individual in return for assistance in this regard. Please contact us to speak to a committee member if you are in a position to offer sponsorship or make a donation.